High quality Sterling 925 Silver Necklet Wire cable style neck chains and wide solid Collars. Gem stone studded Silver collarette necklaces and 925 Silver Wire Necklace Necklets. Studded Sterling .925 Silver Collar Necklace. Wide Stud set Collar type Necklet. 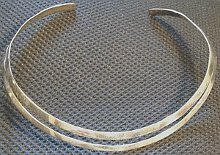 Sterling Silver wide Necklet Collar. Quality Lobster Claw clasp. Fitting Length adjustable upto approx 365mm. High RRP! Studs set with Red coloured stones. 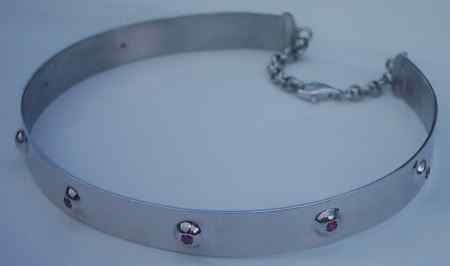 Approximately 12mm wide large Sterling Silver solid Collar. 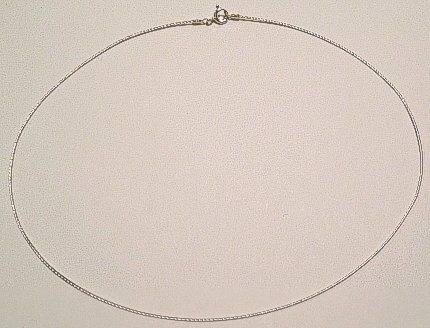 Sterling Silver excellent Cable Design Necklet 410mm (16inch). 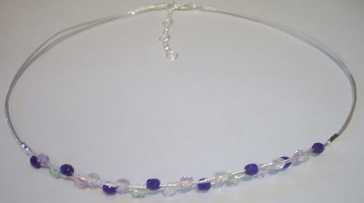 Sterling Silver set Coloured Crystal corded Necklace. Available in Blue or Purple, 410mm length. Sterling Silver Onyx Beads long elegant Ladies 22inch Necklace. Flower design large Silver Beads with polished Onyx Beads multiple strand Necklace. Wide multi faceted Sterling Silver continuous link snake design necklace chain in 410mm length x 3mm wide. Round snake design elegant chain. 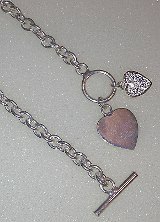 Sterling Silver very heavy Heart Tag Pendants CZ set 410mm T-Bar Toggle Necklace Chain. Solid belcher style chain 6mm wide with T-Bar and Toggle Loop clasp and Two Heart Pendant Tags attached, one set with Sparkling Cubic Zirconia Stones. All in solid heavy Sterling Silver and elegant Classic Design. Sterling Silver Necklace made of continuous Silver Flowers shape design. Approx. 370mm length (15inch) with wide 7mm Flowers creating a very Pretty design Necklace Chain. Sterling Silver solid Double design Collar Necklet. Approx. 12mm wide double solid Silver Neck Collar. Diameter approx. 140mm. Solid Sterling Silver polished Necklet Collar. Designer open ended Collar in solid 2.5mm gauge flattened 925 Silver with polish finish and fully hallmarked. Approx. diameter 140mm (adjustable). Large Ladies Sterling Silver drop 4 strand Necklace. 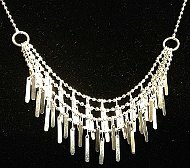 410mm (16inch) beaded chain with 4 strands of dangling Silver droppers, forming a very elegant looking Ladies 925 Silver Necklace. Approximate maximum drop width 35mm. Fancy Large Ladies Sterling Silver Beaded link Drop Necklace. 410mm length (16inch) elegant designer multi strand bead Necklace. 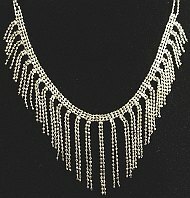 Large jewellery piece with beaded strands and multiple bead chain with long approx. 50mm drop length. Sterling Silver continuous quadruple Beaded design snake neck chain. 410mm (16inch) length unusual chain in design of 4 continuous beads snake type necklace, approx. 2mm gauge wide. 18inch Sterling Silver continuous quad beaded snake design elegant necklace, 2mm gauge quadruple beaded snake link in 460mm length. 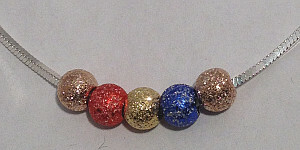 Sterling Silver coloured Glitter Balls Necklace on square Snake design Chain 410mm long.